DITA celebrates the publication of ​The Five Quintets b​y Irish-poet Micheal O’Siadhail. It is a work of poetry and cultural history, and it ​o​ffers a sustained reflection on modernity―people and movements―in poetic meter. The work was commissioned by DITA as part of the ​Theology, Modernity, and the Arts​ (TMA) project, our current major research initiative. ​The TMA project aims to bring theologians and artists together to ask how the arts can help us better understand from a Christian perspective the modern ideas, forces, and movements that have made us who we are. The results are both academic and artistic. In the book’s introduction, O’Siadhail asks: ​how would we describe the contemporary world? He suggests that in order to better understand our present moment and our future trajectory, we must know our history. 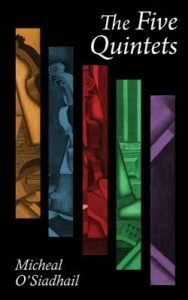 O’Siadhail spent 9 years writing ​Quintets​ and ​j​ust as Dante, in his ​Divine Comedy,​ summed up the Middle Ages on the cusp of modernity, ​The Five Quintets ​takes stock of a late modern world on the cusp of the first-ever global century.